For almost 40 years, astronomers have wondered whether an anomalous 72-second radio signal from space may have been an attempt by extraterrestrials to contact us. 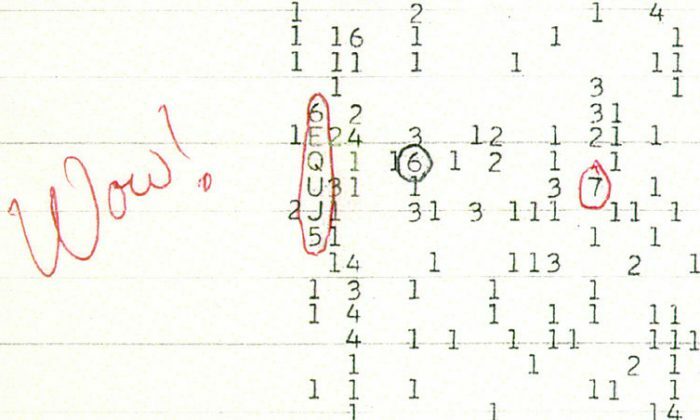 On Aug. 15, 1977, astronomer Jerry Ehman looked at a computer printout from the Big Ear radio telescope in Ohio. He saw the intense spike in radio waves and wrote the word “Wow!” on the printout, giving the signal the moniker it is known by today. The signal was at roughly the same frequency as the waves emitted by a hydrogen atom changing states. Astronomers suspected a communication from intelligent extraterrestrials might have exactly this characteristic. One reason for this suspicion is that hydrogen is the most common element in the universe. Another reason is that this frequency could easily penetrate the Earth’s atmosphere, a New Scientist article notes. “It was the most significant thing we had seen,” Ehman recalled in an interview with Cleveland’s The Plain Dealer. Strange Radio Signal From Space Still a Mystery 40 Years Later: Alien Communication? Astronomers hoped to decipher some meaning in it, but were unsuccessful. And no similar signals have been received since, leaving it a mystery. Astronomer Antonio Paris at St. Petersburg College in Florida, however, announced that he thinks the signal may have been created by comets. His paper was published online in the Journal of the Washington Academy of Sciences on Jan. 1. The comets were not detected until 2006, and so were not previously considered in the search for sources of the “Wow!” signal. James Bauer of the Jet Propulsion Laboratory in Pasadena, Calif., expressed doubts about Paris’ theory. In 2017 and 2018 when the same comets again enter the same region of space, an analysis of their hydrogen signals could confirm Paris’ theory. A fighter pilot in the Peruvian Air Force was no novice when he took aim at a threatening balloon-shaped object hovering above his airbase at Arequipa, Peru. Skeptics and proponents of the ancient aliens theory have faced off for decades on the issue of the Dogon tribe's allegedly advanced astronomical knowledge.